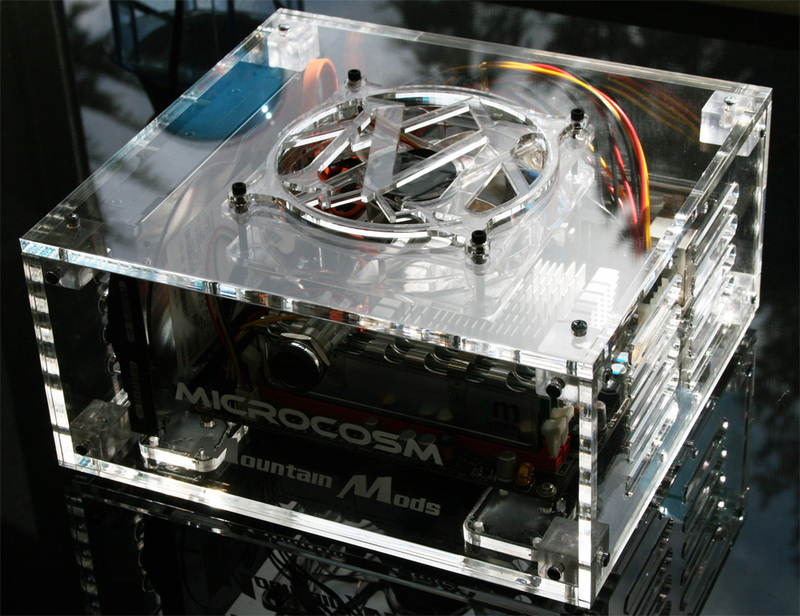 Enter Mountain Mods first mITX computer case the Microcosm. The Microcosm is made from American high grade quarter inch thick cast acrylic. This version of the Microcosm fits mITX boards with external power blocks only. No space is available for internal power supplies. The dimensions are 9.5 inches wide, 8.3 inches deep, and just 4.5 inches tall (4.75 inches tall with attached acrylic feet). The Microcosm also has space for one 3.5 inch hard drive. With the terabyte hard drives of today this makes the Microcosm a very small, compact, low powered and adequate HTPC or file server option. A single 120mm Fan cutout is incorporated into the top of the case to allow for superior cooling. A 120mm fan can be installed in either exhaust or intake mode . Ventilation holes are laser cut on the side panels to allow for airflow to passively enter or exhaust the case. The case includes 4 left and 4 right AC assembly blocks, 1 x 30 pack of long 3mm screws for assembly, 1 illuminated Anti-vandal switch and leads for on/off and led operation, Motherboard standoff pack and 4 extra standoffs to lift the hard drive off the side panel allowing for adequate flow. (DOES NOT INCLUDE FAN and/or FAN GRILL). All panels are precision laser cut and etched with our laser cutter/engraving machine. Choose from a variety of Acrylic colors.